A broad majority of Ukrainians say their country should remain a unified state (77%). Fewer than two-in-ten (14%) believe that regions that want to leave should be allowed to secede. Support for maintaining Ukraine’s borders is especially widespread in the country’s west (93%). A majority of east Ukraine also wants to be one country (70%), including nearly six-in-ten Russian-only speakers (58%). Still, a significant minority of Russian-only speakers in the east support allowing regions to secede (27%). In Crimea, just 12% say Ukraine should remain united, compared with 54% who say regions that want to leave should be allowed to secede, while 34% say they either don’t know or do not want to offer an opinion. When asked specifically about the Crimean referendum on secession, majorities of Ukrainians believe it was not free and fair (60%) and say that the government in Kyiv (Kiev) should not recognize the results (57%). Western Ukrainians are clearly unified in their opinions on Crimea. More than eight-in-ten (84%) say the referendum was not free and fair, and a roughly equal percentage (82%) says Kyiv should reject the results. Crimeans are also nearly unanimous, but in the opposite direction – 91% say the referendum was fair and 88% say the government in Kyiv should recognize the results. Attitudes in the country’s east, meanwhile, are more closely divided – 35% say the referendum was fair, while 44% say it was not. 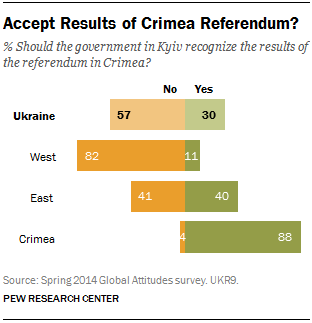 Similarly, 40% in this region say Kyiv should affirm the outcome, but 41% disagree. Russian-only speakers in the east are especially likely to say the election was fair (51%) and should be recognized as legitimate (60%). When asked their attitude toward different ethnic groups, overwhelming majorities in Ukraine say they have a favorable opinion of ethnic Ukrainians (96%), Jews (87%), Russians (84%) and Tatars (84%). With regard to ethnic Ukrainians, favorable attitudes are highly uniform across the territory of the country. Views toward ethnic Russians, however, are more positive in the country’s east (93% favorable) than either the far west or center west (60% and 81% favorable, respectively).3 Meanwhile, there are smaller differences by language, with Russian-only speakers more favorable toward ethnic Russians (94%) than either bilingual (85%) or Ukrainian-only speakers (73%). 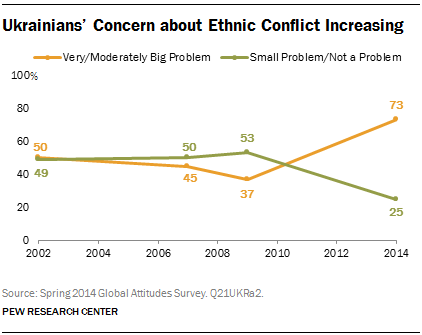 Nonetheless, concern about ethnic conflict within Ukraine’s borders has spiked in 2014. Overall, 73% of Ukrainians say ethnic conflict is a big problem in their country, including 40% who say it is a very big problem. In 2009, just 37% said such conflict was a big problem, including only 15% who thought it was a very big concern. Western Ukrainians (77% big problem) and those in the east (74%) are nearly equally worried about ethnic conflict in Ukraine. Among eastern Ukraine, Russian-only speakers and other language speakers, alike, express concern. Relatively few Crimeans, on the other hand, say they are plagued by ethnic conflict – just 32% think it is a big problem in Crimea. The survey also asked respondents about the “Right Sector,” a nationalist organization that played a major role in the Maidan protests and whose presence has sparked worries about anti-Semitism and racism in Ukraine. Barely two-in-ten Ukrainians (19%) say supporters of the Right Sector are having a good influence on the country, compared with almost two-thirds (65%) who say the organization is having a negative impact. Overall, few in the country’s west (34%) or east (7%) give the Right Sector positive evaluations, although Ukrainians in the far west are somewhat more likely to describe the Right Sector as having a good influence (42%). While these results suggest that Ukraine is not characterized by deep-seated ethnic hatreds, the politics of ethnic identity are still evident, especially on the question of whether the Russian language should share official status with Ukrainian. According to a 2012 law, regions in Ukraine with significant Russian populations are allowed to use Russian to conduct official government business. However, an attempt in the early days following President Viktor Yanukovych’s removal from office to repeal the law has brought the status of the Russian language to the fore. Today, a bare majority of Ukrainians (54%) think both Ukrainian and Russian should be official languages, while 41% say Ukrainian should be the only legally-recognized language. There are clear and deep divides on this issue by regions and by language spoken. Among western Ukrainians, nearly two-thirds (66%) say Ukrainian should be the only official language, while just 30% say both Ukrainian and Russian. Support for a Ukrainian-only policy is widespread in the far west (79%), but a majority (56%) in the center west also agrees. In the east, opinion is the reverse – 25% say just Ukrainian should be legally recognized, while 73% say both. Russian-only speakers in the east (86% both) are particularly supportive of both languages being legally recognized. 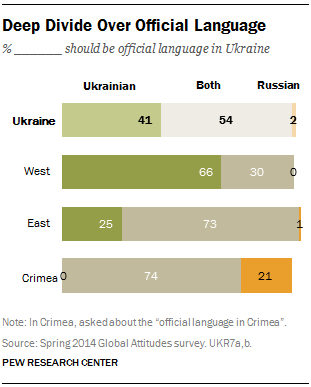 A broad majority of Crimeans (74%) say both Ukrainian and Russian should be official languages in Crimea. About two-in-ten (21%) say it should be Russian only and nearly no one says it should be Ukrainian only. Despite a widespread desire for unity, there is little confidence among Ukrainians in the new government in Kyiv. Not including Crimea, a majority of Ukrainians (63%) say a lack of political leadership is a very big problem in their country. Eastern Ukrainians (71%) are much more concerned about inadequate political leadership than those in the country’s west (55%). Roughly four-in-ten Ukrainians (41%) say the government in Kyiv is having a good influence in the country, while 49% say the new government’s impact is bad. Six-in-ten western Ukrainians think Kyiv is doing well, compared with just about a quarter of those in the country’s east (24%). Russian-only speakers in the east (82% bad) are particularly sour on the new administration. Ukrainians are split on acting President Oleksandr Turchynov’s performance — 42% say his influence on the country is good while 46% say it is bad.4 Western Ukrainians (59%) give Turchynov much higher marks than easterners (27%). In the east, negative attitudes toward Turchynov are more concentrated among Russian-only speakers (82% bad influence). In addition to negative views of the current government, many Ukrainians doubt Kyiv’s commitment to protecting citizens’ rights. Overall, roughly a third of Ukrainians (34%) say the new government in Kyiv protects individuals’ rights, while more than half (53%) say it does not. In the country’s east, people are particularly skeptical – about two-in-ten (21%) say Kyiv respects personal freedoms, compared with nearly two-thirds (66%) who say it does not. Western Ukrainians, on the other hand, have a more positive image of the new regime, with half saying it respects personal rights, although about four-in-ten in the west (37%) disagree. Perhaps due to a lack of confidence in the new political leadership and pervasive concerns about rights violations, fewer than half believe the upcoming presidential election in Ukraine will be fairly conducted. About four-in-ten (41%) say the vote is likely to be honest, while half say a fair election is unlikely. 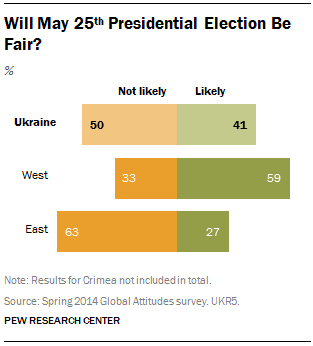 Western Ukrainians have much more faith that the approaching election will be fair (59%) than easterners (27%). In the east, Russian-only speakers are particularly skeptical about the upcoming election: just 19% say it will be fair, compared with 75% who say it will not. Crimeans are very satisfied with the leadership in Simferopol. Roughly eight-in-ten (83%) say Prime Minister Sergey Aksyonov is having a good influence on the way things are going in Crimea. Similarly, 82% give the government in Simferopol high marks. 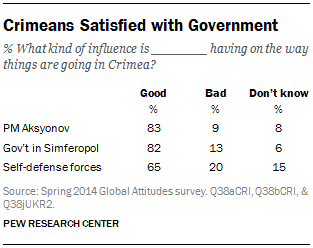 A majority of Crimeans (65%) also say the self-defense forces have had a positive impact on Crimea. Self-defense forces played a major role in the events leading up to the referendum vote in Crimea. On April 17, Russian President Putin said he had sent the Russian military into Crimea to support the self-defense forces prior to the election. In stark contrast, Crimeans are extremely critical of the government in Kyiv. Fewer than one-in-ten (7%) think the Ukrainian government respects personal freedoms. And just two-in-ten say the upcoming elections for the next administration in Kyiv will be conducted fairly.